Here is our pick of the best things to do in Tulum, Mexico! Tulum beckons the intrepid explorer with tales of ancient Mayan cultures, mysterious ruins and stunning picture-perfect beaches. Have a holiday of a lifetime in this Caribbean paradise. Soak up the sun on a white sandy beach and explore ancient cities. Sports lovers can scuba dive, snorkel, kayak and test their skills at ziplining. Swim with the dolphins or whale sharks to create memories to last a lifetime and take the family on a bicycle ride to an authentic Mayan home. If you love being underground there are miles of caverns and cenotes to explore, some of the best in the world! 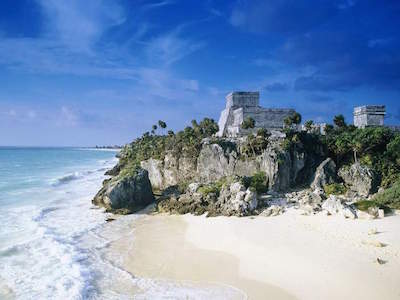 Tulum is an exotic location, known for many things, but it is most famous for its incredible Mayan history. This is a place where you can physically explore the ruins of the ancient Mayan civilisation. 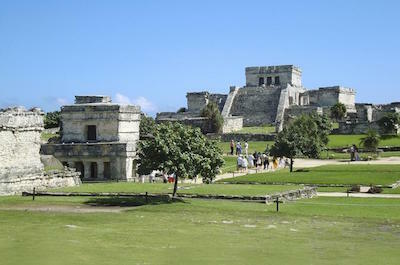 Taking one of the historical tours on offer is a great thing to do in Tulum. Whether you wish to take a private tour or travel as a group, there is something for everyone. 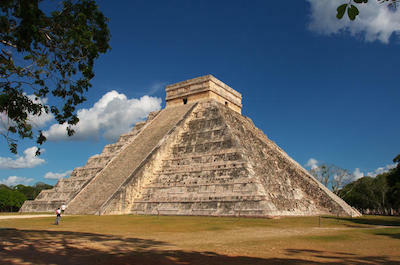 Visit the fascinating Chichen Itza where you will learn about the Pyramid of Kukulkan and the Temple of Warriors. Then head off to the Coba Ruins, an ancient Maya City where you can wrap your head around names like the Nohoch Mul structures, the main pyramid and the Conjunto Pinturas or spiritual area. Next stop is the Tulum Ruins, originally a walled fortress, which also offers stunning views of the Caribbean Sea. Expert certified guides will enthral you with tales of days gone by, after which you will enjoy a traditional buffet. After these tours, you will feel like an expert on Mayan History and culture. Grab your mask, flippers and snorkel and plunge into the clear waters for a day amongst thriving marine life and gorgeous coral reefs - an unmissable thing to do in Tulum for the entire family! Not only will you explore the Caribbean waters, but have the once in a lifetime opportunity to snorkel through underwater caverns and famous Tulum cenotes. Start off by introducing yourself to a few sea turtles and giant whale sharks, swimming alongside them in their natural habitat as colourful fish dart out of your way behind gorgeous coral. Then head to some of the most fantastic cenotes on the island and navigate your way through the underground channels admiring the amazing rock formations that surround you. Enter larger caverns where sunlight shines in through the holes in the rock ceiling reflecting off the water, causing the light to dance along the cavern walls. Complete your snorkelling adventure by rappelling down into one of the caverns in the Riviera Maya Jungle. A once in a lifetime experience and a fabulous thing to do in Tulum! Picture yourself diving into crystal Caribbean waters, drifting through the water and coming face to face with one of the oceans most gentle giants. Swimming with whale sharks is one of the best things to do in Tulum and definitely something to cross off your bucket list. Head out to sea on a luxury boat, keeping your eyes peeled for whale sharks. Once you have spotted one you will have the opportunity to plunge straight into the water and snorkel alongside. Its enormous mouth and majestic movements will certainly be hard to forget but just in case bring along your waterproof camera to capture this moment. Once back on the boat head to the shores of Isla Mujeres where you will enjoy a traditional lunch and have time to relax on Playa NorteÕs gorgeous white sand beach. Watch out for dolphins leaping out of the water and beautiful flamingos strutting on the beach. 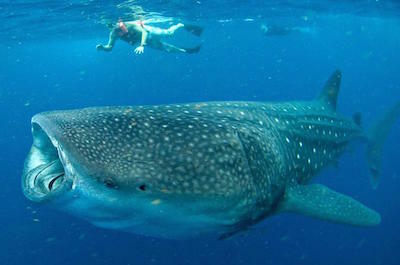 Whale shark adventures are designed for small groups, making them that much more special! 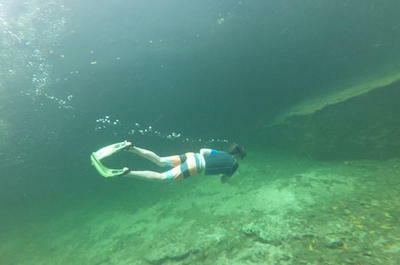 Do something different and explore the cenotes in Tulum! You are in for a fabulous surprise, discovering these magnificent water caverns with your experienced guide. The 5 hour trip visits three of the most famous cenotes, a spectacular thing to do in Tulum. Head to your first stop, Casa Cenote which is described by the locals as the Ôultimate jungle swimÕ. Lined with mangroves and a soft sandy bottom, the cenote is filled with crystal clear water and marine creatures that are more than happy to share the water with you for a swim. Next, visit the Grand Cenote that is half open to the sky and half covered by rock, allowing the warm sun rays to shine onto the crystal water below. Swim through the caverns and admire the gorgeous rock formations before heading to the last cenote, the Temple of Doom. This impressive cenote is completely closed with 3 holes in the rock ceiling and the adventurous can dive into the dark water 10 feet below. 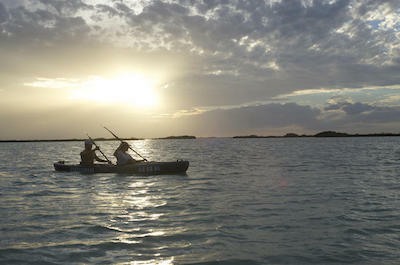 Another great thing to do in Tulum is to explore its waters from a kayak or canoe. Spend a day drifting through the wonderful crystal clear waters with one of the many tours on offer. Visit the Sian KaÕan Reserve or Tankah Park, home to a group of well-known cenotes. Join the Kayak Tour at Sian KaÕan Reserve where you will get to explore ancient Mayan trading routes as you paddle through the mangroves on a 2 hour trip as your guide tells you all about this Unesco World Heritage Site. Look out for exotic birds and other indigenous creatures. After kayaking, enjoy a picnic style lunch made of traditional, vegetarian Mexican food. If you want to get into the water, combine a kayaking trip with some snorkeling where you can explore the magnificent coral reefs underwater and the stunning landscapes from the boat. The best of both worlds! All tours are designed for small groups and your personal safety is ensured as a professional guide will be with you at all times. What could be more exciting than an adventure park set in the middle of the jungle where extreme sporting activities can be combined with total relaxation? The Tankah Park, located in MexicoÕs Riveria Maya offers this and more and is a not-to-be-missed thing to do in Tulum. For the adventurous why not try ziplining across the jungle high above the treetops as cool crisp air whips your face. Then enjoy a trek and spot exotic fauna and flora. Looking for a bit of chill-out time instead? No problem. Climb into a canoe or kayak and paddle along this massive cenote exploring its fascinating rock formations. Take a cooling dip in the crystal clear water and then head back to shore for some sun-tanning. For those who enjoy learning about ancient cultures, visit the fabulous Mayan Village which also showcases traditional crafts and clothing. 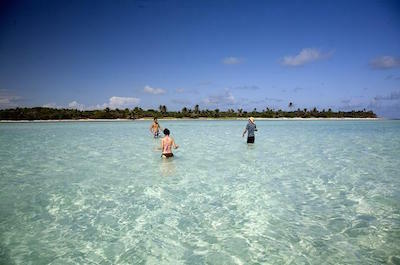 A guided tour to the Park can optionally be combined with a visit to the Tulum Ruins or a snorkeling adventure. Take your pick! 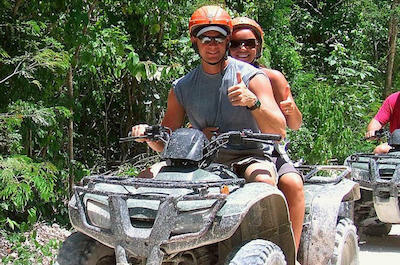 There are few things more exhilarating than zooming through the Mayan Jungle on an open ATV. Luckily this fantastic experience is on offer via a variety of tours and is a firm favourite thing to do in Tulum. Take the Tulum ATV Tour - Off-the-beaten Path adventure and get ready to be thrilled as you navigate twist and turns through the jungle. Once you have set off from your starting point, and are acquainted with your new ride, your guide will point our indigenous plant and animal life. Then, just as the scenery seems as if it could not get better, you arrive at a natural cenote filled with crystal blue water where you will have the opportunity to dive in and cool off with a refreshing swim. Then, head to the monkey sanctuary and meet some cheeky characters who love posing for photographs. If you aren't quite adventured out yet with this adrenaline-filled thing to do in Tulum, test your skills ziplining over the jungle tree tops before enjoying a delicious lunch. 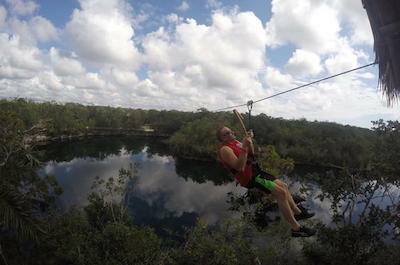 If you have never tried ziplining before, this is the next thing to do in Tulum. With the number of tours on offer, you will be spoiled for choice. All are perfectly safe, with orientation briefings, protective gear supplied and a guide who will be with you at all times. Zoom high above the trees of the Mayan jungle, with the crisp air whipping your face while you view astounding panoramas beneath you. Learn how to jump from platform to platform and adjust the flying speed to suit yourself. On the Selva Maya Eco Adventure Park tour, you will be taken to the heart of the Riveria Maya. Begin your adventure by flying between 9 different ziplines and then clamber over hanging bridges. Next, scale a pyramid structure designed to test your climbing skills and rappel down the other side into a cenote for a refreshing swim. You will have definitely have worked up an appetite after all this extreme activity and a delicious lunch will be waiting for you! 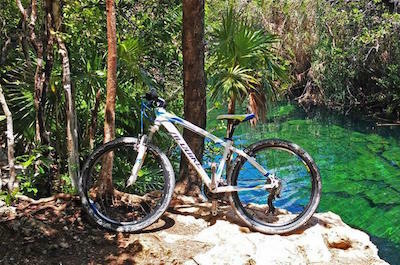 Take the family, jump onto a bicycle and discover Mayan gems such as Sian Ka'an Biosphere Reserve, a wetland sanctuary, rural Mayan villages, hidden forest trails and glorious, crystal clear cenotes. One of the highly recommended things to do in Tulum, if you enjoy cycling, is to take the Tulum InsiderÕs Bike Tour. Follow your guide as you explore iconic Maya ruins and learn about the Mayan history and culture. You will then have a chance to take a dip in the shimmering Caribbean waters before heading downtown to admire art murals. Grab a bite to eat at one of the local vendors, we recommend the tacos and the ice-cream for dessert. Nature lovers will enjoy the trip to the Sian Ka'an Biosphere where you can take a leisurely peddle through the beautiful tropical wetland paradise. Then join a bicycle trip to visit the home of an authentic Mayan family where you will be treated to fascinating stories and a delicious traditional meal. 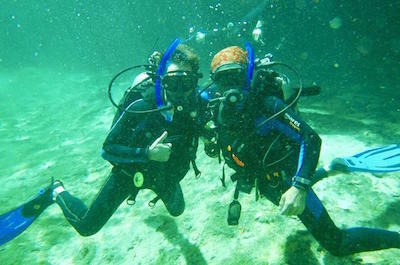 Whether you are a certified diver or a beginner, the waters of Tulum offer fabulous opportunities for scuba diving. For beginners there is a 2 hour introductory course that consists of 1 hour theory and 1 hour underwater diving with an experienced guide. After exploring the amazing Casa Cenote where you can admire the sea life in a unique symbiosis of salty water and fresh water, you are sure to be back for more! Certified divers can join the 5 hour dive from Tulum that takes you to a selection of magnificent cenotes in the Riviera Maya. The tour includes transportation, equipment, snacks and refreshments, all under the watchful eye of a professional guide. These cenotes are beautiful natural pools, that offer up their hidden underwater treasures to divers! Explore the stunning Cenote Dos Ojos, Casa Cenote, Gran Cenote, Cenote Crystal or Calavera. Each dive lasts for about 40 minutes with a break in between to enjoy some refreshments. Diving is an exclusive thing to do in Tulum that caters for a maximum of 4 people, for a fabulous personalized experience. A picture-perfect beach with long stretches of white sand, endless azure blue waters and swaying palm trees makes Playa Paraiso one of the top beaches in Mexico and lives up to its name which means Paradise. Spending a day here is the next definite thing to do in Tulum. Book your beach lounger and umbrella and settle down for a day of luxury and pampering. Eats and drinks are available at a number of top class beach restaurants and there are many posh resorts as well as the famous El Paraiso Hotel near by if you want to stay overnight. For the ultimate indulgence, book a massage on the beach! The waters can get rough depending on the weather, but on calm days, it is ideal for swimming, snorkling or paddling out on a kayak. If you enjoy walking, head up to the north end where you can view the Maya Archaeological Zone of Tulum located on the cliffs. The Sac Actum cave system is one of the longest surveyed underwater cave systems on the planet and offers the explorer a unique experience, diving, snorkling, swimming, climbing and walking in these subterranean passages. Stunning caverns with massive rocky walls enclose crystal clear pools of turquoise waters where an abundance of exotic marine life thrives. Amazing formations of stalactites and stalagmites have formed inside the caves. Join a tour conducted by a knowledgeable guide and learn all about the geology and history of these amazing caverns. The name means Pet Cemetery due to the huge amount of fossilized animal skeletons found during the excavation process. These breathtaking caves that interlink with passages, lakes and pools were a spiritual place to the ancient Mayans and are sure to set your spine tingling as you venture deep into the mystical world, a definite thing to do in Tulum. It may be advisable to wear a wetsuit as the water can get quite cold! 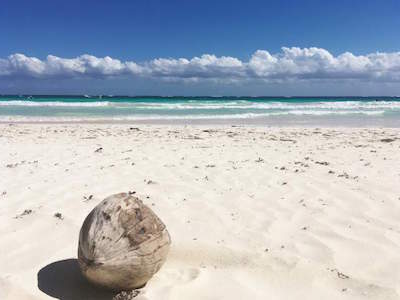 Located near to the famous Tulum Ruins is a magnificent beach that makes the perfect place to relax and cool off after your explorations of ancient Mayan Ruins. The beach is picture-perfect with sugar white sand, towering cliffs on the inland side and endless turquoise waters stretching to the horizon and a must thing to do in Tulum. The beach is accessed via a fairly steep set of wooden stairs, so this may not suit those with very small children and elderly people. Once you are down on the sand, the views of the Ruins on the cliffs are amazing and if you have not yet explored them, you will certainly be enticed to do so! Walk along the sand, spot the iguanas soaking up the sun on the rocks, have a swim and then relax under an umbrella. Sports lovers can snorkel and discover a huge variety of magnificent, colorful marine creatures, corals and sponges. The beach does get busy, so find your space and hang onto it! Vendors will sell you food, drinks and local crafts to take home as a souvenir. Put this on your list of things to do in Tulum! A visit to the Labnaha Cenotes and Eco Park is the perfect thing to do in Tulum if you are a family with children. You will spend a delightful day exploring this beautiful venue and discovering fun activities. The Park offers an exotic combination of jungle and underwater caves that were sacred in the ancient Mayan culture. Explore from the air attached to a zipline and glide over the tree tops becoming one with birds and monkeys! Then cool off in the beautiful Cenote Labnaha where you can snorkel, swim or just dip your toes into the crystal clear waters. Join a tour along the eco paths and learn all about the nature and conservation programs from your knowledgeable guide. The trips are designed for small groups, making them totally exclusive. For an added feel-good vibe, you will learn that the entrance fees go towards protection of endangered species and funding three small Mayan villages. Looking for a high class Beach Club with all the exclusive and world class facilities? Then a visit to Ziggy Beach Club is the thing to do in Tulum. The Beach Club is open every day from 9am to sunset. White sands, swaying palm trees, sunbeds and hammocks await! Ziggy's Restaurant offers delicious eats and sumptuous cocktails from early breakfast to late night dining. You can choose to eat on the beach, on the deck or in a sheltered dining area. Then relax and soak up the Caribbean vibe on a classy beach where you will rub shoulders with the jet setters. If you are planning a grand occasion, a wedding or a romantic honeymoon, Ziggy's is the place to be. If you are just visiting on vacation, this beach and club makes the perfect night time thing to do in Tulum. If one of your life's dreams is to swim with the dolphins, this is one of the most amazing things to do in Tulum. The state-of-the-art Dolphinaris Tulum is designed to give you an unforgettable experience! Set in a stunning location in the lush, tropical gardens of the Hotel Grand Bahia Principe, you will be able to learn all about these fascinating creatures and then swim, kiss and cuddle them up close. Have a dolphin ride holding onto their fins or become a trainer for a day, learning how to feed and look after them and understand dolphin behaviour and physiology. Do you have small children or cannot swim? Don't worry Ð there is a special program designed for non swimmers and children, so they can take part and experience this too! All activities are held under the watchful eye of professional trainers and when you are done, make sure you get that classic photo of your dolphin kiss to show off when you get home. Visiting a cenote with the kids makes a fabulous thing to do in Tulum. The Cenote Zacil-Ha is ideal as it is small and safe, and can be explored by swimming, walking or snorkeling. It is easily accessible by climbing down a small wooden staircase and entering the beautiful jade-colored water. Surrounded by lush green palm trees, this is the perfect setting. 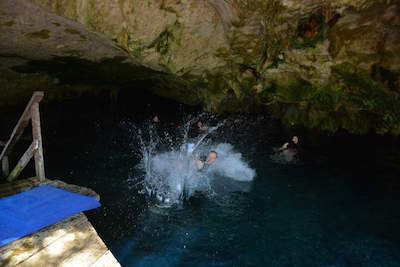 You can relax on the rocky sides of the cenote and the kids will have a blast jumping off them into the water. If you are a bit braver, explore the caves that take you down into a chamber called The Tears, named after the stalactites that have formed in tear drop shapes. The underground caverns are 8 to 35 meters deep and cover a distance of 2 km. After exploring, grab something to eat at the restaurant and soak up the sun, which is always a must thing to do in Tulum. When you get too hot, jump back into the clear waters to cool off! Total bliss!